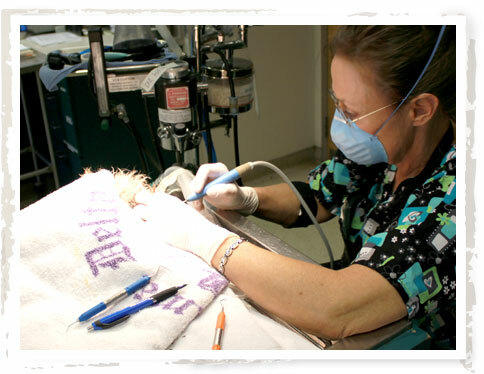 We believe dental cleaning and oral care are a very important part of the overall health care of your pet. Rocky Mountain Small Animal Hospital takes this seriously and will provide the best care possible for your pet's mouth. You may have heard that it is possible to add years to your pet's life with proper dental care. True, but you also increase his or her health, vitality and wellbeing. Proper dental care helps ensure your pet leads the best life possible. Fifty percent of all pets need dental care at any given time. If left untreated, dental disease can not only be painful and inhibit proper nutrition, but it can also lead to serious systemic issues that may threaten your pet's health before symptoms are noticeable. For example, oral bacteria that enter the bloodstream can damage your pet's kidneys, heart or liver. Because of this, we take the oral and dental health of your cat or dog very seriously and believe that dental care is an important piece of your pet's preventative care. We regularly send our doctors for continuing education with a board cerified veterinary dentist so that our skill sets are based on the latest innovations and techniques in veterinary care. The centerpiece of good dental care is a complete oral exam followed by a thorough cleaning. Dental cleanings include ultrasonic scaling followed by polishing and a fluoride mouth rinse, the combination of which is designed to remove plaque and slow its buildup. We offer exams, cleanings, flouride treatments, extractions, and complete preventive oral care. We have a dedicated veterinary dental unit that includes ultrasonic scaler, dental drill, polisher, and complete dental x-ray. Yes, to do a proper dental cleaning, your pet will need to be under general anesthesia. We do not offer nor recommend anesthesia-free dental cleanings. Dental radiography is used to diagnose problems with your pet's teeth below the gum line, including the roots.